Question: "Why did God create the Tree of Knowledge?" "And the Lord God planted a garden eastward in Eden; and there he put the man whom he had formed. And out of the ground made the Lord God to grow every tree that is pleasant to the sight, and good for food; the tree of life also in the midst of the garden, and the tree of knowledge of good and evil.... And the Lord God took the man, and put him into the garden of Eden to dress it and to keep it. And the Lord God commanded the man, saying, Of every tree of the garden thou mayest freely eat: But of the tree of the knowledge of good and evil, thou shalt not eat of it: for in the day that thou eatest thereof thou shalt surely die" (Genesis 2:8-9;15-17). God created the Tree of Knowledge, and then commanded that out of all the trees of the Garden of Eden Adam and Eve not eat from that one tree, because for man to grow and mature, they had to be able to exercise their free will. St. Gregory the Theologian said: "He gave Him a Law, as material for his free will to act upon. This Law was a commandment as to what plants he might partake of, and which one he might not touch. This latter was the Tree of Knowledge; not, however, because it was evil from the beginning when planted; nor was it forbidden because God grudged it to men -- let not the enemies of God wag their tongues in that direction, or imitate the serpent." In fact, St. Gregory says that had Adam and Eve obeyed the commandment, they would have been permitted to eat of it, and that the fruit "would have been good if partaken of at the proper time" (Second Oration on Easter 8). St. Ephrem the Syrian wrote that God made man neither mortal, no immortal. He created man with the potential for both. "Even though God, in His goodness, had given them everything else, He wanted, in His justice, to give them immortal life that was to be conferred by their eating from the tree of life. Therefore, God set down for them a commandment. It was not a great commandment relative to the great reward that He had prepared form them; He withheld from them one tree, only enough for them to be under a commandment. God gave them all of Paradise so that they could be under no constraint to transgress the law.... 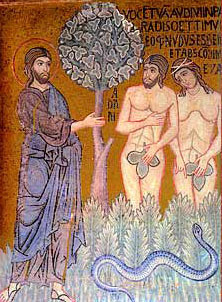 If [Eve] had been victorious in that momentary battle, in that brief contest [the temptation of the serpent to eat of that tree], the serpent and that one who was in the serpent would [still] have received the punishment that they received, while she, together with her husband, would have eaten of the tree of life and would have lived for ever. Along with this promised life that [Adam and Eve] would have acquired, they would also have had by Justice all that had previously been given to them by Grace" (Commentary on Genesis 17:5, 18:4 The Fathers of the Church: St. Ephrem the Syrian, Selected Prose Works, trans. Edward G. Matthews, Jr, and Joseph P. Amar (Washington, D.C.: Catholic University of America Press, 1994), p. 109f). "When therefore He had furnished his nature with free-will, He imposed a law on him, not to taste of the tree of knowledge. Concerning this tree, we have said as much as is necessary in the chapter about Paradise, at least as much as it was in our power to say. And with this command He gave the promise that, if he should preserve the dignity of the soul by giving the victory to reason, and acknowledging his Creator and observing His command, he should share eternal blessedness and live to all eternity, proving mightier than death: but if forsooth he should subject the soul to the body, and prefer the delights of the body, comparing himself in ignorance of his true dignity to the senseless beasts, and shaking off His Creator’s yoke, and neglecting His divine injunction, he will be liable to death and corruption, and will be compelled to labor throughout a miserable life. For it was no profit to man to obtain incorruption while still untried and unproved, lest he should fall into pride and under the judgment of the devil. For through his incorruption the devil, when he had fallen as the result of his own free choice, was firmly established in wickedness, so that there was no room for repentance and no hope of change: just as, moreover, the angels also, when they had made free choice of virtue became through grace immovably rooted in goodness" (Concerning Foreknowledge and Predestination (Book 2, Chapter 30 of Exposition of the Orthodox Faith). Question: "I often hear sin is sin and no sin is greater than another. What's the church's stance on this particular subject?" We see that there are degrees of sin very clearly in Scripture. 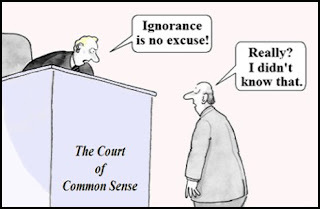 For example, in Numbers 15:22-31, we are told about a general sacrifice that was offered for the unintentional sins of the people, and individuals who became aware of an unintentional sin could make an individual offering, But then it says that those who have sinned "presumptuously" (which in Hebrew literally means "with a raised hand") are not covered by these sacrifices. You also see that different kinds of sins are dealt with very differently in the canons. Some sins can warrant very lengthy excommunications, but then when it comes to other sins, one simply needs to confess the sin, and no penance would be necessary. It would be ridiculous, for example to not recognize that there is a significant difference between mass murder, and someone briefly having an unchristian thought about another person. Of course even the most minor sins need to be repented of, and we should never excuse ourselves and ignore them, but both Scripture and Tradition recognize that not all sins are equal in their seriousness. Concerning these you must know that, just as a physician is required to know what the illnesses of the body are in order to treat them, you who seek to be a Spiritual Father are obligated to know what the illnesses of the soul are, that is, sins, in order to treat them. Although the illnesses of the soul are many, they generally fall into the following three categories. Hence, you need to know which are mortal, which are pardonable and not mortal, and which are sins of omission or inaction. Those good works, or words, or thoughts, which are capable of being done or thought by someone, but through negligence were not done, or said, or thought, are called sins of omission,  and are brought forth from the mortal sin of despondency, as we have said. I know very well that these sins of omission are not considered by people as full sins, because those are few who consider it a sin if they did not perform such and such a charity when they were able to, or had the means to either give good advice to their neighbor, or to do a certain amount of prayer, or do another virtue, and did not. Click here to see the footnotes. 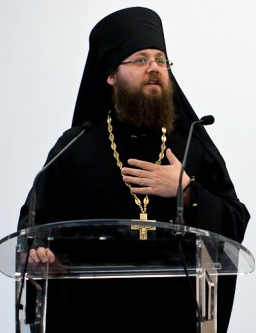 The Holy Synod of the Russian Orthodox Church just approved the election of Archimandrite Irenei (Steenberg) as bishop. Here is a machine translation of the Russian text. CONSIDERED the approval of the decision of the Synod of the Russian Orthodox Church on election Archimandrite Irenei (Steenberg) bishop of Sacramento, Vicar of the Western American Diocese. In accordance with paragraph 17 of Chapter XI of the Constitution of the Russian Orthodox Church, the norms of the Charter apply to the Russian Orthodox Church Outside of Russia in view of the Act of Canonical Communion of 17 May 2007. In accordance with the Act of Canonical Communion of 17 May 2007: "The bishops of the Russian Orthodox Church Outside of Russia are elected by her Council of Bishops or, in cases stipulated by the Regulations of the Russian Orthodox Church Outside of Russia, the Synod of Bishops. The election is approved by canonical norms by the Patriarch of Moscow and All Russia and the Holy Synod of the Russian Orthodox Church. " July 1, 2016 the Synod of Bishops of the Russian Orthodox Church elected Archimandrite Irenei (Steenberg) bishop of Sacramento, Vicar of the Western American Diocese. July 6, 2016, His Grace Metropolitan of Eastern America and New York Hilarion addressed to His Holiness Patriarch of Moscow and All Russia Kirill with the request to approve the decision of the Holy Synod. To approve the decision of the Synod of the Russian Orthodox Church on election Archimandrite Irenei (Steenberg) bishop of Sacramento, Vicar of the Western American Diocese, leaving the place and time of his ordination to the discretion of the Hierarchy of the Russian Orthodox Church. Question: "What is the unforgivable Sin and how do people commit it?" "Holy Scripture speaks of cases or conditions when sins are not forgiven. In the word of God there is mention of the blasphemy against the Holy Spirit, which "shall not be forgiven unto men, neither in this world, neither in the world to come" (Matt. 12:31-32). Likewise, it speaks of the sin unto death, for the forgiveness of which it is not commanded even to pray (1 John 5:16). Finally, the Apostle Paul instructs that "it is impossible for those who were once enlightened, and have tasted of the heavenly gift, and were made partakers of the Holy Spirit, and have tasted the good word of God, and the powers of the world to come, if they shall fall away, to renew them again unto repentance, seeing they crucify to themselves the Son of God afresh, and put Him to an open shame" (Heb. 6:4-6). In all these cases, the reason why the forgiveness of sins is not possible is to be found in the sinners themselves, and not in the will of God; more precisely, it lies in the lack of repentance of the sinners. How can a sin be forgiven by the grace of the Holy Spirit, when blasphemy is spewed forth against this very grace? But one must believe that, even in these sins, the sinners, if they offer sincere repentance and weep over their sins, will be forgiven. "For," says St. John Chrysostom about the blasphemy against the Holy Spirit, "even this guilt will be remitted to those who repent. Many of those who have spewed forth blasphemies against the Spirit have subsequently come to believe, and everything was remitted to them" (Homilies on the Gospel of Matthew [Homily 41]). Further, the Fathers of the Seventh Ecumenical Council speak of the possibility of forgiveness for deadly sins: "The sin unto death is when certain ones, after sinning, do not correct themselves . . . In such ones the Lord Jesus does not abide, unless they humble themselves and recover from their fall into sin. It is fitting for them once more to approach God and with contrite heart to ask for the remission of this sin and forgiveness, and not to become vainglorious over an unrighteous deed. For 'the Lord is nigh unto them that are of a contrite heart'" (Ps. 33:18)" (Orthodox Dogmatic Theology, trans. Fr. Serpahim (Rose), (Platina, CA: St. Herman Press, 1984), p. 289f). St. Augustine makes the identical point in his sermon on Matthew 12:32. He says that it is not merely the act of blaspheming the Holy Spirit which is unpardonable, but refusing to repent of that blasphemy: "...even this shall be forgiven, if a right repentance follow it...But that blasphemy of the Spirit Himself, whereby in an impenitent heart resistance is made to this so great gift of God even to the end of this present life, shall not be forgiven" (Sermon 21 on the New Testament). So as long as a man lives, repentance is possible, but if he persists in rejecting the Holy Spirit, it is impossible for him to be pardoned, because there is no pardon without repentance.